UPDATE: As of early 2018, MR Ringo has closed its doors. It is unclear if they will return on the online market. Mr. Ringo is a casino and sportsbook registered and licensed by the government of Curacao. Better known for their casino servises, Mr. Ringo is also a competent Sportsbook. This operator took life in 2014 by three entrepreneurs with experience in offline gambling and has been consistently gaining traction in the industry over the last two years. The interface is flash based and not the most attractive, but it is very intuitive and easy to use, with contrasting colors and sharp edges – and, after all, usability is the most important (and it`s also not a matter of taste, like the design is). Beginners should feel very comfortable browsing and using the website. My take is simple: modest design, excellent functionality. Mr Ringo will double your first deposit with a 100% welcome bonus up to 100 Eur, available for all countries accepted at this bookmaker. The rollover conditions are not the best, as you have to bet 10 times on odds over 1.80 to withdraw the bonus – but at least they are straight up, with no strings attached. Mr Ringo has two very interesting ongoing promotions – a 20% bonus if your account is empty and you deposit on a Monday, alongside a random value freebet up to 50 EUR if you enter the code HAPPY20 daily between 7PM and 9PM CET. If you fancy trying out their casino section, there are plenty of bigger bonuses available (ex: up to 1200 Eur welcome bonus). Unfortunately, odds at Mr Ringo are poor, there`s no other way to say it. Margins can be as low as 1.81 – 1.81. Prices and payout percentages are below average and for this reason this bookmaker is not suited for high rollers – especially as limits are very low as well. You can bet up to 1000 Eur on the big events and generally up to 500 Eur on events of mediocre importance, but these amounts are also conditioned by odds. Low – level competitions can see limits as low as 50 or 100 Eur if you are attempting to bet singles with low odds. The betting coverage at Mr Ringo is very good and it compensates somewhat for the poor odds. You get plenty of sports and events, from E-Sports to the second division of Icelandic Women’s football. Decent asian handicap offer and plenty of betting options associated even with the lesser events. Mr Ringo really does a good job in providing a vast betting offer and, also, they are usually very fast in dishing out odds. 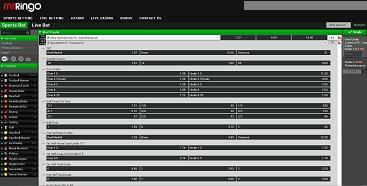 The live betting platform is particularly fast as responsive, as you would expect from Mr Ringo. This is very important when betting live and even though many bookies offer fast platforms, they still deserve bonus points for making live betting an excellent experience. There is a fair number of in play events you can bet on and there is a satisfactory number of betting types associated as well, so good job Mr Ringo – even if live streaming is absent. The mobile platform follows the same trend of fast speed and great usability. Nothing to shout about, it is simply a very good service. Visa, Mastercard, Skrill, Skrill 1-Tap, Neteller, PaysafeCard, EcoPayz, Trustly, Sofort and Bank Transfer are the payment options available at Mr Ringo. That is a pretty good variety of payment providers. Customer support is only available between 11:00 and 19:00 CET (including weekends), so it`s not 24/7 and that is a serious downside. On the bright side, contact options include e-mail and live chat, as well as a useful FAQ section. My communications with them have been Ok – a little sluggish at times, but overall all my problems were resolved professionally. The conclusion would be that custommer support is decent and fair at Mr Ringo. Mr Ringo is an excellent casino and a decent bookmaker. Poor odds and low limits on sports betting are the only reasons why they don`t excel as a Sportsbook and are not suited for high rollers, but they are putting more and more focus on their Bookmaker operations. They are fast, simple and secure, which is always an excellent foundation. Really great bonuses as well. As we are only rating their bookmaking services here on Betdistrict, we can`t go higher than 3.5 stars – as in all honesty, they can not compete (yet) with the industry leaders. However, MrRingo is a very good bookmaker for beginners or casual players and an excellent choice if you fancy hitting the slots or the roulette tables from time to time between your bets. Join MrRingo Sportsbook and claim a 100 Eur (100%) welcome bonus now! MrRingo bookmaker review by Betdistrict ©. Updated monthly.